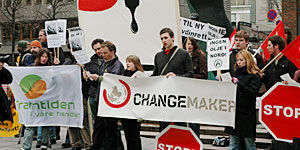 At high noon, 31 March, many in Oslo, and many more around Norway watching alive TV broadcast, stopped to glimpse what the next phase of the Norwegian Oil Adventure would look like. In a conference room at the Petroleum and Energy Ministry, the Prime Minister, as well as the Ministers of the Environment, of Petroleum and Energy and of Fisheries and Coastal Affairs presented the integrated management plan for the Barents Sea and the ocean areas off the Lofoten Islands, including the announcement of the awards from the 19th Licensing Round. Although it is positive that the plan allows further development of the areas around the Snøhvit and Goliat fields, as well as a continuation of exploration activities in the Barents Sea, no petroleum activity will be permitted in the Nordland VI, Nordland VII or Troms II areas while this government is in office. Statoil believed a more aggressive approach would be forthcoming. “We had hoped to come further with specific impact assessments now,” says Terje Overvik, executive vice president of Statoil’s Exploration & Production Norway business area. This immediate reaction from Statoil may be indicative of oil industry’s opinion, yet it is certainly too early to gauge the effect on Norway’s competitiveness. The Norwegian Oil Industry Association (OLF) finds the plan to be a political compromise that will slow business development in northern Norway. OLF feels that Troms and Nordland counties are especially adversely affected. “Norway would be best served by mapping what oil and gas opportunities exist in all of northern Norway. At the same time, it is positive that the activity in the Barents Sea can continue,” says Per Terje Vold, director general of OLF. For many of those living in northern Norway, the plan is disappointing. Many in the north hoped that they too could share in the Oil Adventure, bringing much-needed jobs and possibly alleviating the endemic decline in population. They now await hopefully the soon-to-be-made announcement concerning Shtokman contracts. All in all, the key words include “compromise”, “co-existence” and especially “while this government is in office”. During the press conference, much was made of continuing development of the plan, as well as the release of an updated study in 2010. Time will tell if this compromise “side-by-side” strategy will be a “win-win”, a “lose-lose” or just “so-so”.